Jan Kritel Krumpholtz was born in Prague on 5 August 1747. 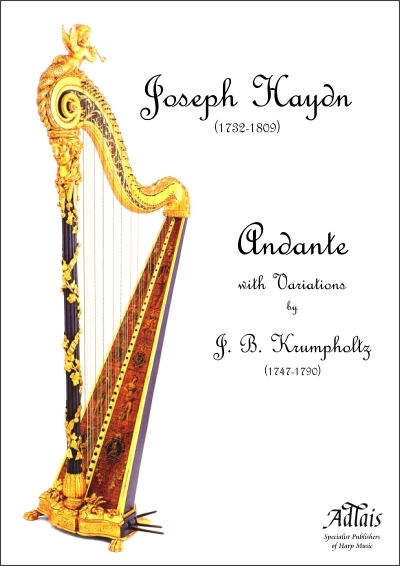 His mother was a harpist who, as Krumpholtz himself says 'had no inheritance to leave me other than her passion for the harp'; his father was a military bandsman in bond to the powerful Kinsky family, who were great landowners and patrons of the Arts. As a young man Krumpholtz was taught to play the horn, the violin and the viola, but he longed to have composition lessons, and longed to play the harp. 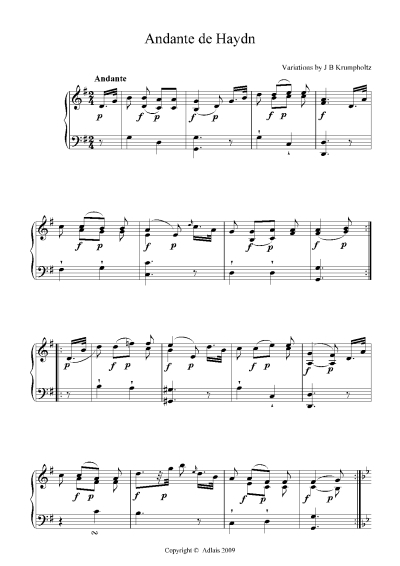 Aged fourteen, he reached Paris, where he had some harp lessons with Christian Hochbrucker, but it was after some five or six years as a military bandsman playing horn that he eventually reached Vienna, where Georg Christoph Wagenseil encouraged his attempts at composition. It was in Vienna that he wrote his first harp concerto, entrusting the scoring to his compatriot Vàclav Pichl. In July 1773, Haydn heard him perform this concerto, and was so impressed that he offered him an immediate engagement at Esterházy. On 1 August 1773, he signed his indenture as J B Krumpholtz, the form of his name by which he became best known. Krumpholtz stayed at Esterházy for three years, and during this time he worked with Haydn on his sixth concerto. He was most probably the harpist when Haydn conducted a performance of the Italian version of Gluck's Orfeo ed Euridice at Esterházy in 1776. Apparently encouraged by Haydn, that same year he took a two-year leave of absence, arriving in the autumn at Metz, where he worked in the harpsichord workshop of Simon Gilbert. By February 1777, and married to Marguerite, Simon Gilbert's daughter, he had arrived in Paris; with them was the ten-year-old child prodigy harpist, Anne-Marie Steckler, later to become his second wife. In Paris, Krumpholtz soon became known for his talents as harpist, composer, teacher and inventor. He played his 5th Concerto at the Concert Spirituel, taught and composed (he was most probably the teacher of Mademoiselle de Guines, to whom he dedicated his Receuil de douze preludes), and worked closely on improvements to the harp, especially with Jean-Henri Naderman. He was a close neighbour of Naderman in the rue d'Argenteuil, and a Naderman harp with which he may have been associated figures on the cover of this publication. After the death of his first wife, on 26 February 1783 Krumpholtz married the sixteen-year-old Anne-Marie Steckler, and three children were born to them before 1787. Leaving a distraught Krumpholtz in Paris, Anne-Marie Krumpholtz left for London, where she was a sensational success. Haydn was, of course, in London at this time and Anne-Marie featured at his benefit concert at the Drury Lane Theatre on 13 May 1788. Whether or not she ever paid him the compliment of playing her husband's Variations on Haydn's Andante is not known. The innocence of this delightful early piece is in sharp contrast to the highly dramatic sturm und drang of Krumpholtz's late harp works of which the Sonate dans le style pathétique (Op.14) (Adlais catalogue no. 101) gives an insight into the mental torture and turmoil which led Krumpholtz, in Paris, in a final dramatic gesture of despair, to end his own life.